Weddings are expensive, and more often than not the things purchased for ceremonies and receptions are used only once. Borrowing some of the items needed for your wedding can help you cut costs. 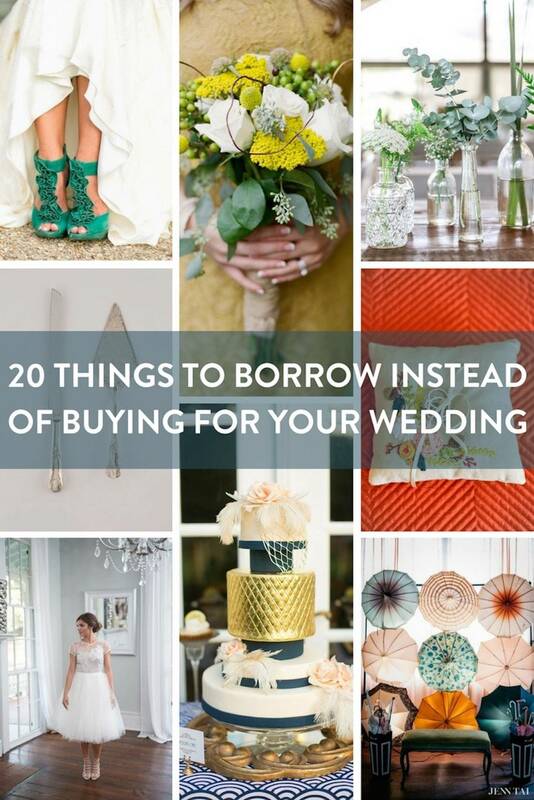 Here are twenty things (big and small) you can borrow instead of buy for your upcoming nuptials. Table centerpieces can really be expensive, so send out an email to your friends and family asking to borrow vases, glasses, or mason jars. Have a plan in place for each item's return before you ask to borrow something. This gives the owner confidence that their item won't get lost in the clean-up. You can achieve a more eclectic or "collected" look for your wedding by borrowing home decor pieces (like hurricane or lantern candle holders) for you centerpieces. While a cake stand isn't too expensive, it's the little stuff that adds up. Cut costs by borrowing a cake stand from a friend, and take it to your decorator to use for your cake. Tip: Make a simple cake stand something more grand with a wall mirror. In the wedding above, I added a borrowed wall mirror to give this on-loan cake stand a little extra punch. It can be hard to find enough tablecloths to borrow for all your reception tables. But, you can save money by borrowing tablecloths for some of the spaces, like for serving tables, guest tables, or the cake table. Styling Trick: To get a "floor length" look, use two tablecloths and hide the seam with a patterned fabric remnant. Place the serving table against a wall so the tablecloth only needs to drape on one side of the table. The above wedding used a mismatched set of borrowed serving trays to serve sweets at the dessert table. Place a sticker or piece of tape on the bottom of anything borrowed with the name of the person who gave you the item. Have a designated bin (or bins) for all borrowed things to be stored during clean-up so they can be returned properly. Save yourself and your bridesmaids some money by allowing them to borrow a dress. Once you pick your wedding colors, go to a fabric store and cut fabric remnants in the colors that will blend and work with the look you are aiming for. Give the fabric remnants to your bridesmaids to use as a guide as they ask friends for potential dresses to borrow. You will be "friend of the year" for saving them money and your wedding will be unique. I don't have a little girl, but many of my friends who do have flower girl dresses wasting away in their daughter's closets. I wish some mama would have given me this idea. My mid-twenty self, nowhere near mom stage, had no clue the closet life of flower girl dresses... it's worn once and then outgrown six months later. Have the mom of your flower girl ask her friends if they have a dress her daughter can borrow. It doesn't even have to be an official "flower girl" dress. If you give parameters or a color theme, most of the time a fancy dress will work. Veils are usually worn for pictures, your 45 minute ceremony, and then taken off so you can move and groove at your reception. Before spending $500+ on a veil, see if your married friends have one to loan you. If you can't borrow, save money by renting your veil instead. Veil rentals are typically less than $50 for the day at places like Rent the Runway. This is such a fun thing to borrow from friends or family - and you carry a piece of them with you all day when you borrow their beloved jewels. You will need baskets and boxes for things like programs, flower girl petals, and party favors. These are easily borrowed items if you don't already have them yourself. Your grandmother probably has a really nice set of these sitting in a drawer ready for you to use. I actually forgot to get these for my wedding. The day of my wedding my coordinator/friend called a neighbor when she realized I had forgotten. I had no clue (nor did I care when I found out afterward) that I was cutting my cake with Joe and Debbie's engraved cake server! Wait... what? What I mean is "borrow" your bridesmaid bouquets as decor at your reception. Leave a few empty vases on reception tables and have your bridesmaids place their bouquets there during the reception. This will help you save money on centerpieces and wedding decor. Without a place to store their bouquets, your bridesmaids will likely lay them down somewhere at the reception to dry out, so you might as well use what you paid for to the fullest! And, if your bridesmaids want to keep them, they can pick them up before they leave. This works really well if you have done your pictures beforehand. Don't let those beautiful large flower arrangements sit at your ceremony venue during the reception. Plan ahead and get your coordinator or a friend to take them to your reception after your ceremony is over. When you book your ceremony or reception venue, ask if there's any decor they have available for you to use. Often churches have wreaths or decor they use for other occasions. It may not be your style, but it's a worth a look. Often times this decor is free or included in your venue cost. I didn't use them, but my ceremony venue had candles stands that fit their pews perfectly. If you are having a religious or cultural ceremony, your ceremony venue might have specific items to accommodate these traditions such as communion glasses or unity candelabras. Christmas time is where "borrowing" decor from a church or venue really works. Most churches are already decorated with trees, poinsettias, and garland, and won't mind you incorporating them into your decor. Borrow a pillow for your ring bearer to carry with or without the ring. A cute pillow can make for a great photo for your wedding book. Let's be honest though, the photo will be the only time the pillow will really be noticed. Instead of renting furniture, borrow that special piece you want to use in your wedding. Ask your best friend if you can borrow a favorite pair of shoes for your wedding. Get creative with your photo backdrop and borrow fun accessories so your guests can take fun, stylish pictures! I love this unique umbrella backdrop - which is so simple and an easily borrowed. Look through a younger or older family member's costume closet for fun jewelry, hats, and sunglasses. Ask your florist for the leftover flowers they don't use to make your bouquets and ceremony decor. Most florists order over what they need to make specific flower arrangements. The flowers are paid for by you, even the extras, and most brides don't know to ask for them. Have the florist deliver them (preferably in a bucket of water) when the flowers are delivered, or have someone pick up the extras when the florist is done making the arrangements. Set aside extra vases and use the extra flowers as centerpieces, or in places that need a little extra decor. 19. Respectfully borrow the skills or time of friends and family. We all have gifted friends or loved ones who love to help out in anyway they can. Say "yes" to good friends and family who offer to help you! Maybe it's having a party to stuff and address your invitations, or asking your friend with awesome handwriting to paint lettering on a large sign. Enlist a group of friends who are not involved in the wedding party to help you decorate on the day of your wedding. You will save money enlisting good friends to help, but don't be skimpy. Use a little of that saved money to put toward 'thank you' notes or even gift cards to say how much their help means to you. If you are on an extreme budget, borrowing a dress from a family member or friend of a similar size can be a huge money saver. My wedding dress has been in a box for almost 12 years and I would happily loan it to a friend if they wanted to wear it. It can be tricky to make it fit perfectly, so another way to do this is to "borrow a dress" from a rental site such as Borrowing Magnolia. Renting is a very affordable way to wear a high-end dress. Afterwards, you can take all the money you saved from borrowing to decorate your new home! If you are planning a wedding, here are 14 sneaky ways to save even more money on your wedding.